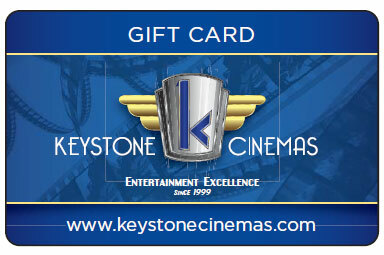 With our new Keystone Gift Cards, you have complete control over the value of your gift or reward. They can be used for tickets or concessions and can have additional value added at any time. They’re great as a reward for employees and are always appreciated at birthdays and the Holiday Season. Gift cards are now available ONLINE and at our box office. Gift Cards are accepted at both locations.